Firstly, the video clip is from season one of Fantasy Island. With all of the computerised special effects now being used in TV and film, Fantasy Island now looks rather dated. But in the early eighties we knew no different and the series was extremely popular and ran for seven seasons. I have only vague memories of this strange TV show, which was set on an island in the Pacific Ocean. But I do remember that it was just one of those programmes you had to watch right until the end. Fantasy Island ran from 1978 until 1984, and the storyline always involved Mr Roarke (the tall one) inviting two guests onto the island to live out their fantasies. Tattoo was Mr Rourke's little companion. I do remember that he always rang a bell and then pointed to the skies and shouted "De Plane, De Plane" in the opening sequence of every show! 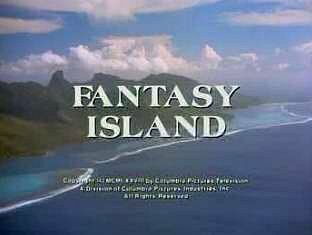 Before it became a tv series, Fantasy Island was introduced to viewers in 1977 through two highly-rated made-for-tv movies. The TV series averaged just over 20 million viewers during its first three seasons in the US, but by season five the show had fallen out of the top 30. 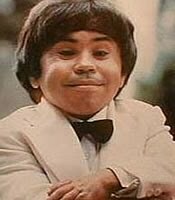 Photo taken for the 1977 TV movie Return To Fantasy Island featuring Ricardo Montalban as Mr. Rourke and Herve Villechaize as Tattoo. I was sceptical about buying this DVD as I have such vague memories of the 80s show. But after seeing the low price for the complete season 1 DVD, and also seeing the rave reviews on Amazon, I decided to take the plunge and buy it. So was it any good?